I used them to have all guests write a comment on a note card and then clip it to a picture board (had several). All the notes will be able to go into the baby book and the picture board can be put in the baby's room afterwards. I used these to hang up cards from my grandkids in my kitchen....they always check for the ones they gave me to be sure I hung them up! I used these at a baby shower for the "forbidden" game. (It's forbidden to say, "baby" or perhaps cross your legs). They were a little smaller than I thought and I saw a couple break, but overall super cute! I had been looking for the perfect "thing" to hang a lot of pictures in my 3 year old's room. We bought decorative ribbon that I swooped on the walls and I couldn't figure out what to hang all the 4 x 6 pictures with. These clips are perfect! They hold the weight perfectly, and don't pinch the pictures in any way. It would also be perfect for hanging art on a string, etc.. I am very happy with these clips! 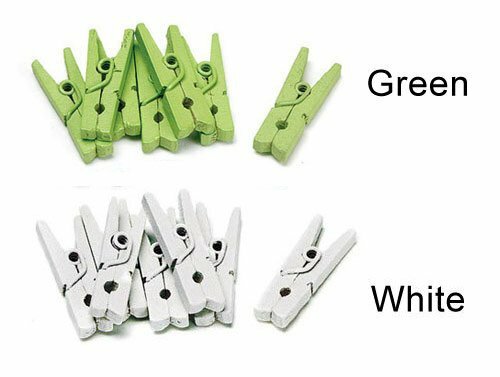 Add a little color to your event with these brightly colored, mini wooden clothespins. They are perfect for attaching place cards or gift tags. For a fun, country baby shower presentation, pin place cards to "clotheslines". Perfect for outdoor or garden-themed baby showers. 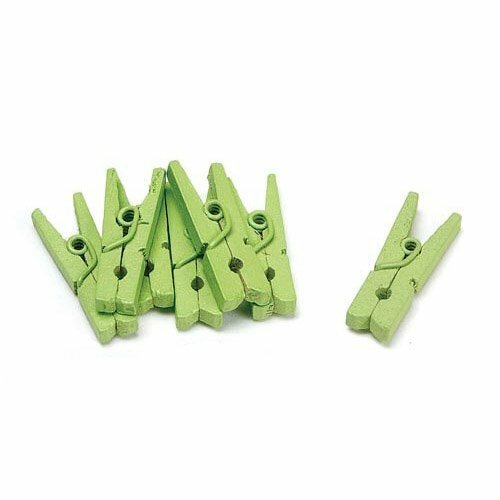 Each pack of mini wooden clothespins comes with 24 clips. Available in green and white. Pins measure 1" x 0.13" each.